John was born at Webb, Alabama, on 30 October 1911. He married Sallie Mae Tabb at Decatur County, Georgia, on 21 August 1929.1 John Thomas Hughes died on 3 February 1973 at Panama City, Bay County, Florida, at age 61. 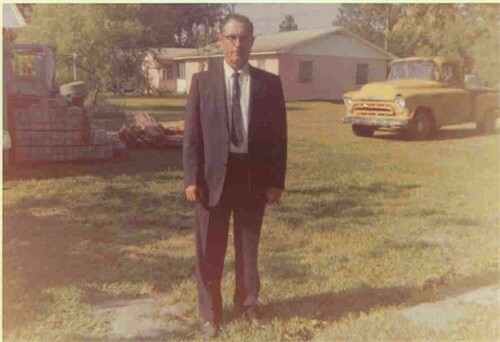 He was buried after 3 February 1973 at Evergreen Memorial Garden Cemetery, Panama City, Bay County, Florida. John Thomas Hughes , Jr.
John was born at Panama City, Bay County, Florida, on 7 July 1933.1 He died on 24 September 2013 at Panama City, Bay County, Florida, at age 80. Lavaughn was born at Panama City, Bay County, Florida, on 22 July 1938.1 He died on 22 August 2013 at Tampa, Hillsborough County, Florida, at age 75. Garland was born at Newville, Alabama, on 1 January 1923.1 She married Marvin W. Tabb on 19 April 1941.2 Garland Jackson died on 9 June 2010 at age 87. She was buried on 12 June 2010 at Lynn Haven Cemetery, Bay County, Florida. Penn Winslow Pierce was buried at Blakely, Georgia. He died at Spartanburg, South Carolina. Penn was born at High Point, North Carolina. John was born at Georgia on 2 May 1912. He married Ruth Esther Tabb on 6 September 1929.1 John Washington Wright died on 1 July 1982 at Early County, Georgia, at age 70. He was buried after 1 July 1982 at Blakely, Early County, Georgia. Homer Dennis Wallace died. Homer was born. David was born. He died on 26 November 2000. Cloyse C. Tabb married Tommie Lou Bosley. Cloyse was born at Frederick, Tillman County, Oklahoma, on 8 September 1917. He died on 26 August 2001 at Garland, Dallas County, Texas, at age 83. Harlen was born on 18 April 1928. He died on 23 November 2006 at age 78. He was buried after 23 November 2006 at Altus Cemetery, Altus, Jackson County, Oklahoma.